Stephen Furst is the founder and CEO of Smart Material Solutions, located in Raleigh, North Carolina. Smart Material Solutions is an NC State start-up with expertise in nanofabrication, precision engineering, and smart materials. 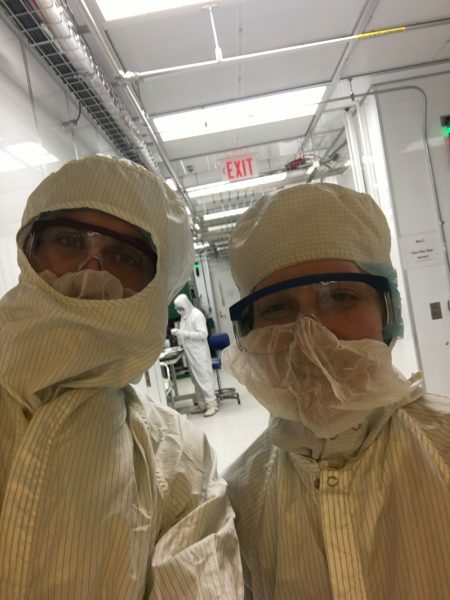 Their goal is to develop and commercialize nanocoining – a scalable and cost-effective nanofabrication process that is hundreds of times faster than electron-beam lithography. At AIF, Stephen has benefited from the RTNN Kickstarter Program. Read on to learn more about this former NC State grad student. I’ve learned that several parties – AIF staff, University professors, and students – are all genuinely interested in hearing about what work is being done by a local company. How has your company benefited from the Kickstarter Program? The kickstarter program allowed our startup company to get training and take critical measurements on multi-million dollar pieces of equipment. These early measurements helped in our efforts to win funding from the National Science Foundation! Did you know about the facilities/tools/techniques before participating in the Kickstarter Program? Yes, I first learned about a lot of the equipment at the AIF while in grad school at NC State. What have you learned from your experience in the Program? How is your research impacting the community (i.e. who is it helping, what are you hoping to find, etc.)? Locally, our company is contributing to the startup ecosystem that is becoming a point of pride for NC State University. We’ve hired 3 NC State student interns and participated in classes in the College of Management and events at the AIF. But the results of our research have potential to bring exciting benefits of nanostructured surfaces from the lab scale to the commercial scale. These can be used to make brighter electronic displays, higher-efficiency solar cells, components for augmented or virtual reality, or many more high-value surface textures! Is there a staff member at AIF who has helped you? Roberto Garcia and Phillip Strader have been our biggest partners, but I think at some point we’ve worked with everyone at the AIF with great results! To contact Stephen or his team, check out their website. Published in 2019, AIF, Recent News, User Spotlight.